This entry was posted in baseball, branding, Media, micro+blogging, sports, tweetup, twitter and tagged baseball, san francisco giants, sf giants, sports, tweetups, twitter. Bookmark the permalink. Does this post go down in history as a prime example of amateur reporting and writing? I don’t think I read anywhere in this article why the tweetup is ‘Social Media Overkill’. Please try to support your thesis. This article should have been titled, ‘I was confused when I bought tickets to a Giants Tweetup’. The page with the ad has buttons, like the one you clicked on, that say ‘buy tickets’. The description mentions it’s a pre-game party and talks about where your game seats will be. Not sure how you missed that you were buying game tickets. The promotion page for this event was posted at midnight the day of the announcement, which is standard for updating/upgrading large websites hosted on many servers. I don’t think the Giants would announce a tweetup at midnight on twitter to instantly support their live webpage, they waited until everyone was awake to tell them about it. 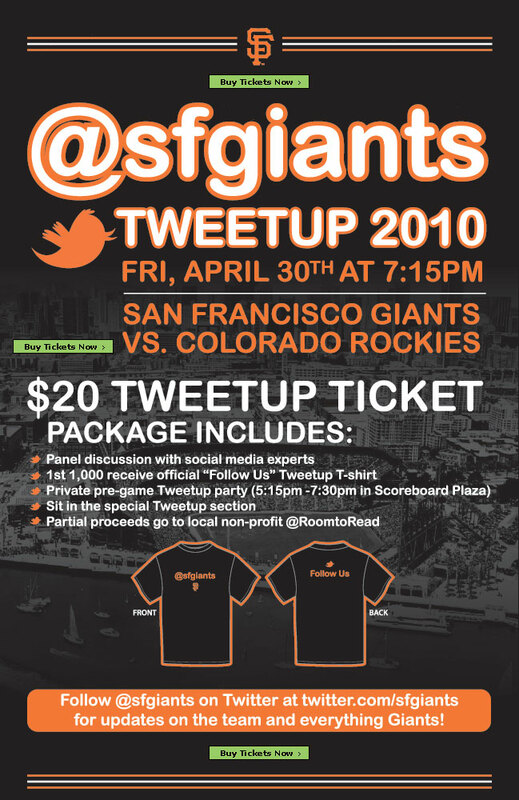 If you look at the sfgtweetup tweet, it was made 1AM just hours before the official announcement was made on twitter. If you follow the Giants’ two twitter accounts you will see the list of the people in the panel. After that homework is done, you will see that the people in the panel are baseball players or reporters who use twitter. Which sounds appropriate and very fun for a ball game. I don’t even know why I clicked and read this article. Have fun at the event. LOL..this is priceless! So you’re saying customers should do their “homework” and if they don’t “get it”, it’s their fault and not the organizers? If I were to take a wild guess, I think you’re one of the “bright” minds who came up with this idea and that would explain why you took the time to leave this comment. If you had really read my entire post, you would have realized that I am asking a simple question – why would anyone would want to attend a panel discussion with social media “experts” at a ball game? And the “pre-game” party you’re referring to, is actually a Tweetup with a $20 price tag. If you hadn’t been so selective in your reading, you would have noticed that I admit that I couldn’t figure out how to book the tickets for the Tweetup and it wasn’t clear if the game tickets were included in this price. So here’s a crazy notion, how about trying to help out your customers rather than expending so much effort in trying to prove they’re wrong, “Alan”? No I don’t work for the Giants. I was reading another of your blog posts and clicked on this story to since I’m a Giants fan. I was hoping to see an analysis on why the tweetup is a clever use of social media or social media overkill. Unfortunately that’s not what this story was about. It was about a customer and a large corporation that weren’t on the right page. I thought my comment would shed some light on your situation. My name is Bryan and I am one of the organizers of the @sfgiants Tweetup and employee of the SF Giants . I wanted to comment on your blog and answer a few of your questions. We are really excited about this event, and thank you for the ticket purchase and blog post. You bring up some good questions and we hope to answer them. This is our first Tweetup/Special Event. 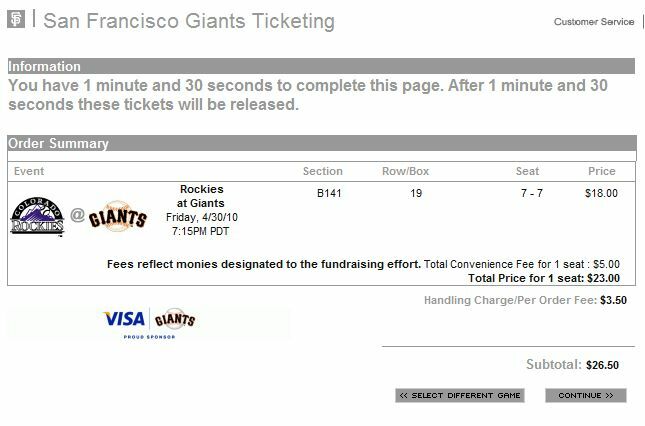 The ticket package of $20 includes a ticket to the game (in the special tweetup section with all fans who purchase this ticket package) an exclusive @sfgiants Tshirt (1st 1,000 fans) and entrance to our pregame mixer. Our pregame panel includes Biz Stone, who co-founded Twitter, Jeremy Affeldt, the Giants pitcher who also tweets (@Jeremyaffeldt) and KNBR morning show host Brian Murphy (@KNBRMurph) who will moderate this event. Also, $2 of every ticket will go to Room To Read, and their founder and CEO Erin Keown Ganju will be there to talk about using twitter in a non profit sense. To answer the initial question, is this a good way of using social media or is it overkill? I guess we will find out, but our intention is to bring together our fans who use twitter and the social media enthusiasts in San Francisco who aren’t Giants fans, and get together and communicate and learn from each other. The great thing about baseball is that is a perfect backdrop for conversations, and are honored to host this event with Biz Stone and many people from Twitter headquarters who helped us organize our first tweetup. For more info on our tweetup, visit sfgiants.com/tweetup or follow us on twitter @sfgiants. Thanks for the response! If you’re open to it, I would love to chat with you post-event and blog about your learnings from a social media POV.